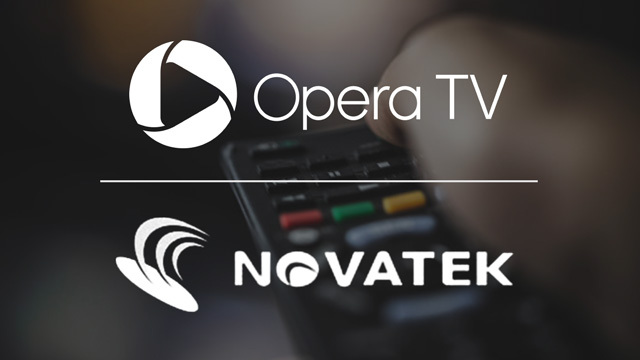 Opera TV, the global market leader in enabling OTT and Novatek, a leading global Display IC total solution provider, today announced the availability of Opera TV’s Over-the-Top (OTT) enabling product suite, pre-integrated on Novatek’s System-on-a-Chip (SoC) TV Platform. This modular solution offers device manufacturers a market-ready solution to launch Smart TV’s with hundreds of popular HTML5-based OTT services. This groundbreaking pre-integrated platform will provide immediate cost savings and reduce time to market for OEMs and content providers seeking to launch OTT services to customers on smart TVs. With continuous innovations in TV and mobile devices in recent years, combined with the rapid evolution of OTT services, consumer demand for high-quality video content continues to grow. The latest Novatek SoCs are packaged with Opera TV’s suite of OTT products including the industry leading Opera TV SDK, a next-generation Blink-based HTML5 engine, heavily optimised for performance with complete support for the latest TV industry standards, the Opera HbbTV 2.0 module, the Opera Media Streaming Module with support for all modern streaming formats; and Opera TV 2.0, an HTML5-based application platform providing tailored and engaging OTT viewing experiences. The integration enables Opera TV to provide more than 1,000 apps to Novatek’s customers for effortless OTT integration onto their devices, significantly reducing time to market. Opera TV’s apps ecosystem includes popular content partners such as YouTube, BBC iPlayer, BBC News and Hulu in addition to other must-have premium OTT apps. Novatek is experienced in SoC design and provides designers with an array of features for a wide range of applications in TVs and integrated digital TV (iDTV), improving consumer’s TV experience. To meet the growing needs of OEMs, Novatek has developed a full range of TV solutions for different market needs and has also successfully introduced the platform with the world’s leading OEMs. CES 2017 attendees can experience a demonstration of the latest integration from Opera TV and Novatek at the Opera TV booth (South Hall 2 Meeting Place # 25270) at the Las Vegas Convention Center January 5 – 8, 2017.